Cake specialities in many varieties, for example homemade fruit cobbless from traditonal receipe. It is served warm with ice cream and prepared with seasonal fruites. A very special treat. We bake our homemade cakes with nuts, cinnamon, chocolate and fruits. We make tortes which are filled with wonderful fruits. Not to forget our fruit-cheese cake, which we bake with a very good old recipe. 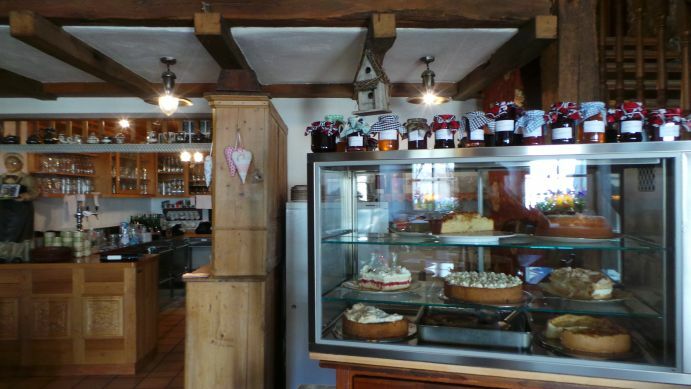 We serve warm meals, our especialities the traditional regional dishes from the Hunsrück for example potato saussage, staffed side pork and liver dumplinger with „Sauerkraut“. We serve grandma`s soup with vegetables and filled dumplinger. Our menu shows you explicit information about ingredients and other dishes for vegetariens or the small appetite. Call for a reservation and we will be glad to make a offer. Call for a reservation and we are glad to make our menus or buffet! We will serve your individual wishes. We like to make for your events and family celebrations your individual Buffet or a 3-course menu. Our head will adwise you well!